I think it was when I read Shopaholic Takes Manhattan (everyone needs a little chick lit sometimes) and main character, Becky, noted how deceiving New York’s weather is compared to London. In London you can look out your window and just know. If it’s damp and dark, it’s cold. If the sun is shining, the weather is probably pretty warm. But New York likes to remain mysterious. Countess days I’ve emerged from my apartment, no matter the season, ill-dressed because the sunshine streaming into my windows suggested it was at least 10 degrees warmer out. But after 6 years of living in Brooklyn, I’ve gained some common sense. I know that after changing my wardrobe from Winter to Spring, I should wait at least a month before banishing the box to storage, just in case. I’ve learned the essentials of layering. That just because it seems warm, the shadows of those tall skyscrapers are like individual ice boxes and evening often exists in a whole other season. 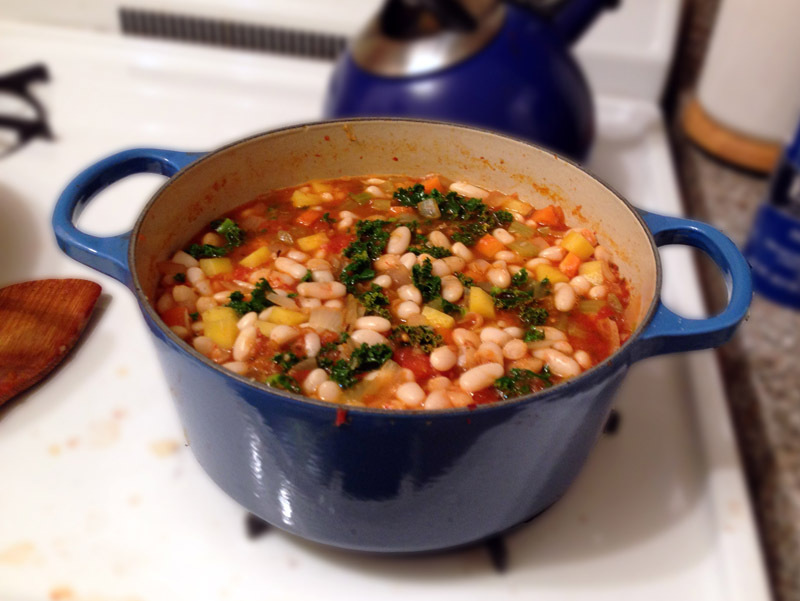 And I know that event though Spring may claim to bring the end of cold weather for a few months, you’ll always find a chilly or soggy night in need of a warm pot of stew or hot soup. This is that stew. Put white beans in a medium saucepan, covered with 1 inch of water and bring to a boil. Reduce heat, cover and simmer for 30 minutes, while you chop and prepare other ingredients, giving them time to soften. Skim any foam and drain. Meanwhile, preheat oven to 250°F. Heat 1 tablespoon of olive oil in a 3 1/2 quart Dutch oven over medium heat. Add garlic and onion, cooking until garlic is fragrant. 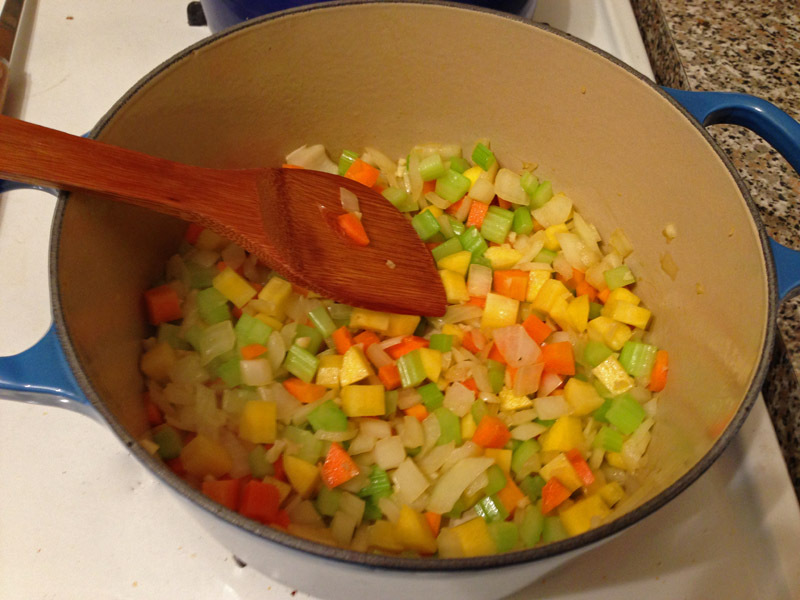 Add carrots and celery and continue cooking until the carrots begin to soften. Stir in Italian seasoning, salt and pepper. Add crushed tomatoes and their juices along with the tomato paste and bring mixture to a boil. Add beans, kale and 2 cups of water, stirring well until kale is completely submerged. Return to a boil. Transfer to the oven, cooking uncovered for 2 hours, stirring occasionally. While the casserole is cooking, make the breadcrumb mixture by mixing remaining 2 tablespoons of olive oil, breadcrumbs and Parmesan cheese until it resembles wet sand. 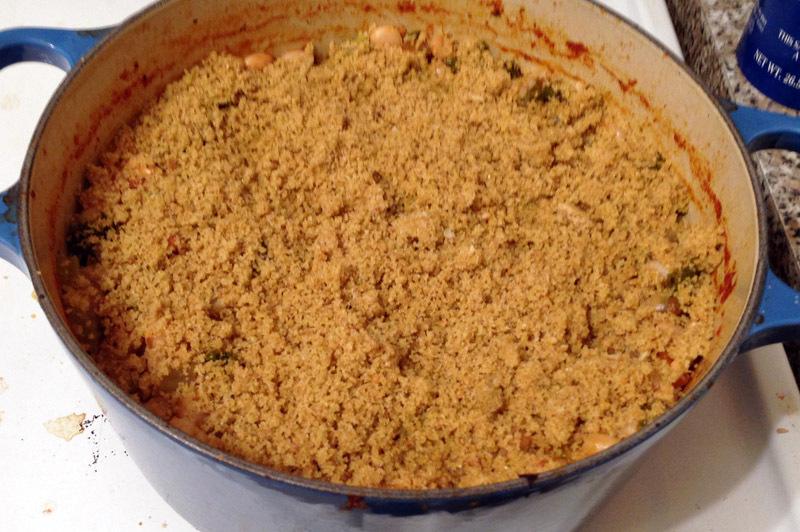 Cover top of casserole with breadcrumb mixture, turn the oven up to 400°F and bake an additional 30 minutes until lightly browned. The weather here has been crazy, 80 one day 50 the next can’t figure out what to wear or what to cook, gazpacho one day and a warming soup the next. 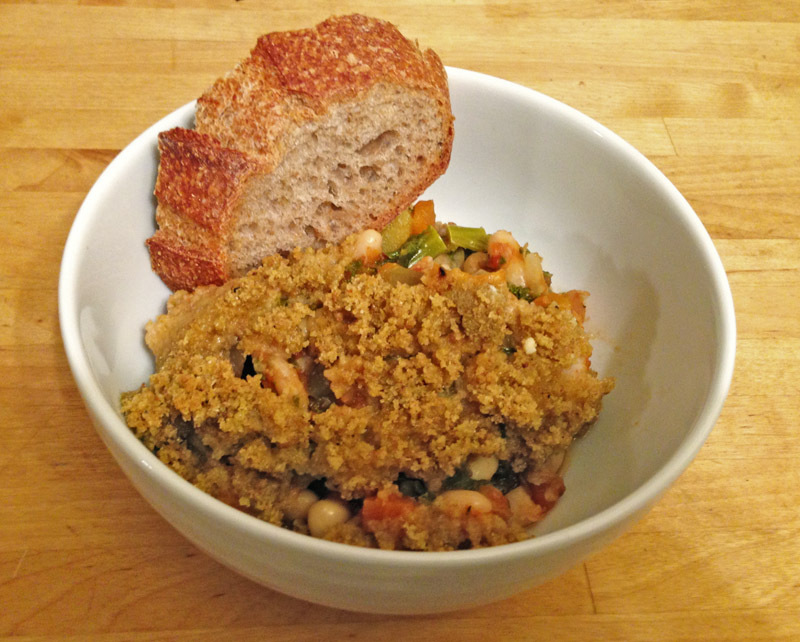 Your recipe is like a ribollita, I love it and it’s perfect on a cool and rainy day. Mmm…I can’t wait for the a straight week of gazpacho days! Hopefully the weather steadies itself soon with some real spring weather. I’m fearful we’ll skip Spring and head right into the humid summer. I have a deep love of beans and greens. I know what you mean. They’re just so comforting. Thanks! As much as I can’t wait for real spring to come and stay, part of me is sad that I probably won’t have another soup or stew until October.